New Fashion trendy Gold Plated White stone three layer ladies Ring. An ideal collection for every season. 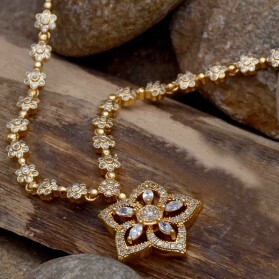 Wear it on different occasion like Party, wedding or festive time; you will be the centre of attention. Classy Cubic Zirconia Slim Finger Ring features sparkling cubic zirconia stones in a prong setting. White/Rose gold plated thin stacking band is a must-have for every woman's jewellery box. Best Birthday Christmas Mother's Day Valentine's Day Gift for Girlfriend, Couple, Mom. One gram Gold Plated Fashion Gorgeous double Ruby Ring . It suits well on both Indian and western dresses on Festive, Engagement, Anniversary or Party. A unique gift for someone you Love. Contemporary cluster ring featuring an oval faceted White American diamond encircled by CZ stones. Captivating one gram Gold plated finger ring featuring square cut Ruby stones encircled by American diamond gemstones. Captivating one gram Gold plated finger ring featuring oval Ruby stones encircled by American diamond gemstones. 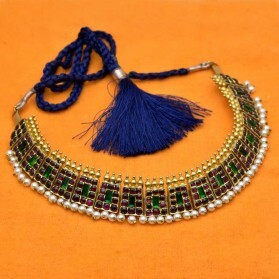 Pair it with any modern or traditional outfit to look elegant on party or Marriage functions. Premium Gold Plated spiral CZ Ruby big leaf Finger Ring. 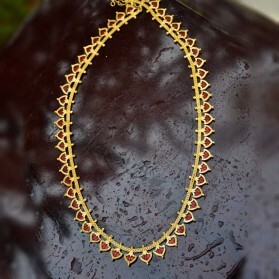 It has American diamond and Ruby stones studded big leaves on both ends. The stunning look ladies ring is an elegant gift for yourself or someone you Love on occasions like Valentine's Day, Mother's Day or Birthday. The synthetic Ruby/AD with crystal round finger ring is white gold plated and set with zircon stones. It is very versatile and can be worn for a formal as well as an informal party. This Gold plated Ring will give and extra ordinary and fresh touch to your Beauty on festive occasions. 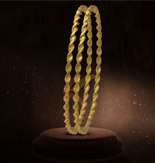 This Kerala's traditional Jewelry has been arranged beautifully with Magenta stone and Nagapadam. The synthetic white gold plated Amethyst stone studded big round Cz's paving floral Finger Ring. It is very versatile and can be worn for a formal as well as an informal party. A beautiful ladies finger ring. The stylish Ruby Ring adorned with CZ stones. Accentuate your feminine charm and enhance your personality by adorning this immaculately crafted gold plated ring. This One gram gold plated classic "Pulinagam" finger ring will give an extraordinary and ethnic touch to your beauty on festive occasions. 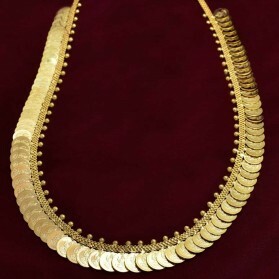 This Kerala's traditional Jewellery has been arranged beautifully with stone and enamel glass stone in the shape of tiger's nail (Pulinakham). This one gram gold plated classic Palakka finger ring will give an extra ordinary and ethnic touch to your beauty on festive occasions. 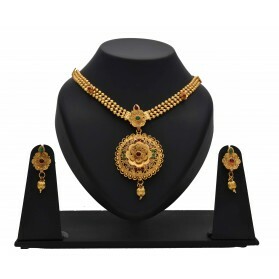 This Kerala's traditional Jewelry has been arranged beautifully with stone and Palakka shape enamel glass stone . This one gram gold plated finger Ring will give an extra ordinary and classic touch to your beauty on festive occasions. This Kerala's traditional Jewelry has been arranged beautifully with stone and Mango motifs made up of enamel glass stones.